A special Thank you to Delacorte Press for sending this book to review. But on the insde, Ayla is still Annie. 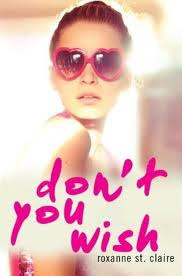 I love this book it is called Don’t You Wish, it is so relatable. I have read so many books where I feel close to the main character but, this book took it to a whole new level. I have read it twice and I am still not over it, I can’t wait to read it again. This book made me extremely thankful to be me. Great book, absolutely made it on the favorite list but, I have to say thats a really long list. So get out there and READ IT! Oooh I'll have to check that one out for sure. Looks good eh! I'm taking this on vacation!